Math Formula – As the development of science and IT continues, more sophisticated mathematics is required. Topics which have been studied theoretically in the past are now proving to be important in quantum physics, computer design, engineering and the financial industry. On the other hand, new mathematical topics are being invented and used to explain discoveries in Physics, Chemistry, and Biology. 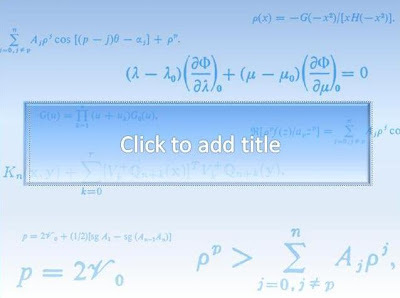 Math Formula is free complete powerpoint template from 4presentation. It is a simple powerpoint template but it is equipped with animation that makes It more interesting templete. This is recommended for presentation themes such as education, science, biology, chemistry, and physics.